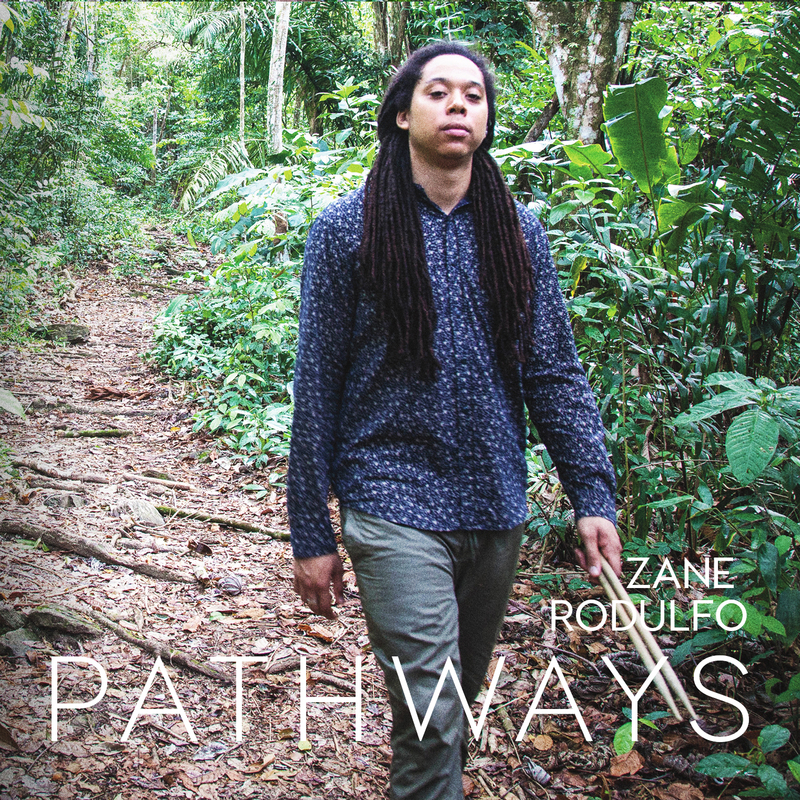 Drummer Zane Rodulfo has released his debut EPPathways bringing to life his own compositions based in the musical traditions of Trinidad. With a playing time just over 33 minutes, Pathways still manages to give a broad spectrum of the rhythms and melodies of Rodulfo’s home and influences. With Rodulfo is a stellar cast consisting of the incomparable Dayna Stephens on tenor saxophone, Nir Felder and Marvin Dolly on guitar, Noble Jolley on piano and Fender Rhodes, Luques Curtis on bass, and Victor Provost and Earl Brooks, Jr. on steel pan. It is the steel pan that is the hallmark of the Yoruba tradition which scattered throughout the Caribbean and northern portions of South America during the days of the slave trading of the 1600-early1800s. Now Rodulfo creates music of joy and memory, thankfulness and reflection with his chosen artists who share in his announcement that Rodulfo is here…and here to stay. This is not the music to draw tourists; it is the music from the heart of Rodulfo, drawing you to himself. Trismegistus, also composed by Rodulfo, comes from a phrase meaning “thrice-blessed” and was a designation of Hermes, messenger of the Gods and healer to humankind. The listener of this music must also be considered thrice-blessed. The rhythms are fantastic between Rodulfo and Curtis. The melodic lines are carried so well by Fender Rhodes and the guitar. It is an exciting piece. It is the melodic lines of piano, guitar and tenor sax that make Rodulfo’s original, Seek, the beautiful piece it is. The cascading piano is a sweet opening of the piece. The guitar assumes the melody and is soon supplemented by the tenor sax. It is not dialogue between them; it is agreement. Rodulfo’s understated playing is perfect for the focusing of the song on its melody and harmonies. It is simply gorgeous. Curtis’s bass solo is warm and emotional. In fact, the whole piece is full of emotion and affection. The ending of the piece is excellent. Retrospect is the final of Rodulfo’s originals on the EP. Dayna Stephens’ tenor sax gets the spotlight and he makes it pay. This may be Rodulfo’s most exciting drum piece. He proves himself master of rhythms in performance as well as in composing. And I love his composing. Noble Jolley takes the spotlight himself with his delightful phrasing on the piano. The heavy groove creates a current that carries them all along. Rodulfo works his enchantments with the ease of breathing and Curtis’ is right there with him in complete recognition and agreement. The guitar and sax trade licks and keep the listener riveted with expectancy but Rodulfo just owns the piece. You have to love his delivery and his harmonic approach. Hourglass is written by guitarist Marvin Dolly. The guitar, tenor saxophone, and steel pan of Victor Provost is enough to set your soul ablaze. The steel pan and the tenor sax get in some excellent trading. This is fun stuff. Provost works the pan beautifully and Stephens answers in gorgeous response. Jolley gets a great turn on the Fender Rhodes, as well. Rodulfo is hot on it again. He forces your attention and you delightedly surrender it to him. It is always a remarkable thing, to witness the arrival of a brilliant new Jazz artist and hear their debut recording. Zane Rodulfo has given the gift of himself—his writing, his artistry, his musicianship—to an audience filled with hope and expectation. He promises a new world in music and he delivers on his promises.